There's a new one that should be added next time that we update it and that's a point about the value of bowling in the nets as a Wrist Spinner. One of the best reading resources that you should try and get hold of are books that deal with or are by Clarrie Grimmett on Wrist Spin. Grimmett was the forefather of wrist spin and possibly the greatest wrist spinner ever and unlike many of the others seemingly more than willing to explain his art. But one of his great observations with regards Wrist Spin bowling was about the usefulness of bowling in nets. 1. Nets sessions are primarily there for batsmen and their use to the Wrist Spinner is negligible. 2. The batsman is able to bat against the bowler with impunity with no consequence for his actions, if you manage to bowl him, he is allowed back for another chance. 3. The batsman therefore approaches his batting in a manner that he would never employ in a match against a wrist spinner. 4. If you do choose to bowl against a batsman in a nets situation disregard and ignore any of the balls that the batsman deals with effectively as it's not how he'd bat against you in a match. 5. Never be disheartened by being smashed every in the nets. If you want to practice you should find yourself somewhere that you can do it alone, so that you can concentrate and focus on your bowling. Both Grimmett and Peter Philpott advocate practicing alone and taking it very seriously and being 100% focussed on what you are trying to do. Grimmett had his own wicket in his back yard where he would practice. I use several places - playgrounds and basket ball courts in the winter and anywhere there's some grass in the summer - outfields of cricket pitches, artificial wickets but mostly football pitches. Look at this bloke Jim on the Big Cricket Forum and the progress he made once he stopped bowling against his brother - http://www.bigcricket.com/forum/t58854-189/ track back through a few pages and see how disillusioned he was before he tried bowing on his own. 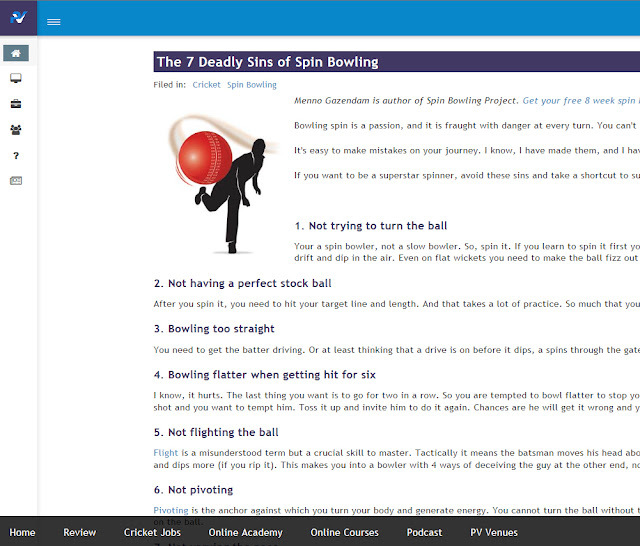 So if you're trying to learn what is known to be the most difficult form of bowling in cricket you've come to the right place - follow the links and check back here and see this resource grow.